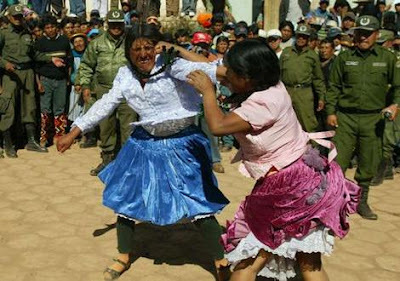 Two Quechua women exchange blows as part of celebrations for the Tinku Festival in the city of Macha, Bolivia. The pre-Colombian ritual consists of rival villages engaging in hand-to-hand combat that tradition says will secure richer, more prosperous crops in the coming year. Yes it´s a world where not everything seems real all the time only on the surface and when you scratch a little well some times you can win big cash prizes, like $10,000 thats a big cash prize or $10 or another ticket or just feck all and you walk away feeling like some one has given you a kick in the balls from the 60 yeard line and they´ve missed. What does all this mean you say ? A fact that is a bit hard to believe since they were caught teaching the Gurilas (No the Hairy type.... i hope) how to blow things up. I know what your thinking, what the feck does this have to do with some lads out birdwatching minding their own business. The answer to that one is, Ít doesnt, they lied, they are lyers boys and gurls, lyers is what they are in fact, and thius is the tale i´m trying to tell you. So anyway the boys are in the Capital, their trial starts, representives are sent from the Irish government to make sure they get a fair trial, big intertnatial incident, big news. And do you know what happened ? The went and fecked off, thats what they did, and turned up in Ireland 6 months later. Probably not, i´m thinking, they dont seem like the kind of bird to have any ionterest in watching things being blown up, no none at all, which doesnt make them any less interesting, well not to me anyway. But sticking to the topic of the story, well the first part anyway. Black Shamrocks, the Military here have hijacked our Shamrock symbol, painted it black and stuck it on their uniform. Dont just sity there, get painting, you dont get paid to sit !!! !